I think I’ve discovered my new favourite fall vegetable, the sweet potato squash! I first discovered this delicious little beauty at my local organic farmer’s market (Riverdale Farm) and the farmer told me I could eat the skin and all! Well, that was enough to pique my interest, as I love eating the skin on most squash, even though most people only eat the flesh. After baking the squash I found the taste to be much like a roasted chestnut, sparking memories of the holidays and cool weather. So, I thought a thick and flavourful soup was in order, and that’s just what I created. I experimented by adding sage and other spices, but ended up deciding they’re just not needed. There are very few ingredients in my final recipe as I feel it showcases the natural flavour of the squash. I hope you enjoy this as much as I did! Note: It takes about an hour to roast the squash, then it has to cool so you can handle it. You can do this in advance if you like. Wash and dry the squash, prick it a few times on each side with a knife tip, place on a baking tray lined with parchment paper. Bake the squash whole at 400 degrees for 1 hour, turning once at the 30-minute mark. Keep an eye on them as some ovens may cook faster and you don’t want them to burn. They should be soft all the way through when you poke ‘em with a fork. Allow the squash to cool before you handle them. 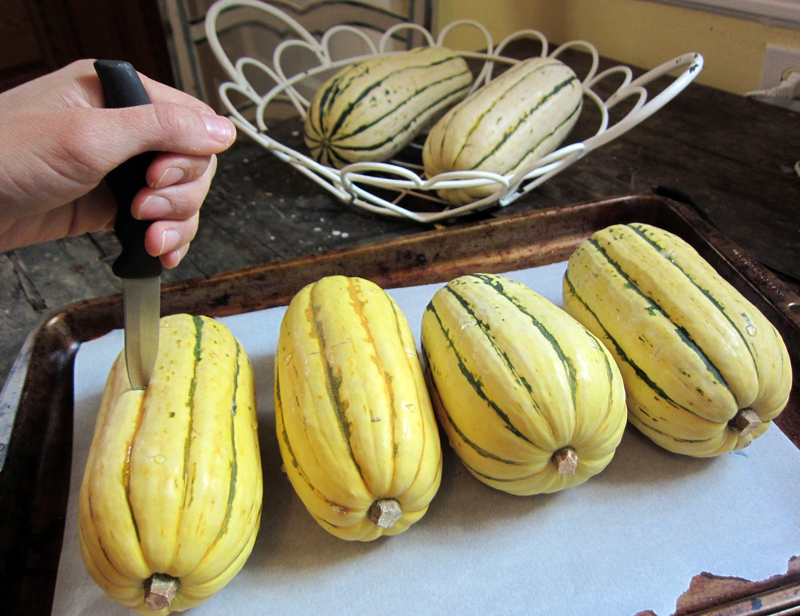 Cut them in half lengthwise, spoon out and discard the seeds. Now spoon out the flesh from the skin and place it in a bowl. We will not be using the skin in this recipe but be sure to taste it… it’s delicious! Now trim off and discard the the dark green parts of the leeks. Cut the lighter, more tender part of the leeks in half lengthwise and wash them well. Try to get any dirt from between the layers. Dry them off and chop them into small pieces. In a large pot, melt the butter and saute the leeks, covered, stirring often, over low-medium heat until soft, about 5-8 minutes. Add the stock and the water and the squash flesh. Turn the heat to high, bring it to a boil, reduce heat to medium-low and simmer for 20 minutes. Let cool and puree. Serve warm. Enjoy! Garnish suggestions: Ground black pepper, grated parmesan cheese.